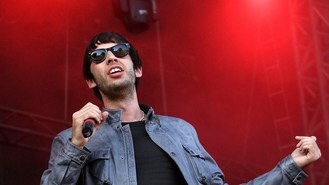 The 31-year-old rapper, whose real name is Elliot Gleave, admitted marriage and music now take priority over drink and drugs. "Back in the day, I did a lot of gigs where we were on tour with The Streets or artists from the label, and because it was new to me, I didn't really take it that seriously, I didn't know what I was doing," he told Metro. "I just thought this whole experience was going to end very soon and I thought, 'F*** it, let's just get absolutely battered every night'. I'd probably have about four cans of Stella (beer) before I even got on stage." The Kids Again singer, who will perform at The Great Escape festival in Brighton, continued: "It was like doing every drug under the sun and staying out late and blacking out and forgetting what you did, just behaving like a complete f***ing idiot really, but I'm glad I got all that out of my system." Example, who married Australian model and actress Erin McNaught last May, said he now realises the importance of looking after himself. "It's important that I train and get sleep when I can, go for runs and have a good diet, otherwise I wouldn't be able to do 150 gigs a year all around the world," he said. "I've changed a lot. I'm quite happy I'm not a drug addict. I'm married and I'm focused," the musician added.